At a press event at Apple Park’s Steve Jobs Theater today (Sep 13), Apple has announced the new iPhone XS, iPhone XS Max, and iPhone XR. Consistent with several of the leaks, the 2018 iPhones offer faster processors, improved cameras, up to 512GB storage, and new color finishes. 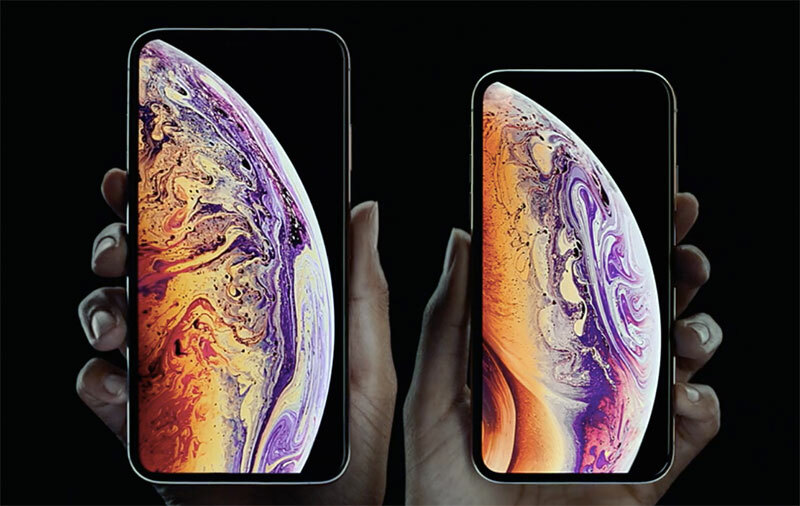 While all three are X series phones, the new super-flagship phone is the iPhone XS Max, which features a 6.5-inch (diagonal) edge-to-edge OLED display with a notch at the top to make room for the front-facing camera and Face ID tech that debuted on the 2017 iPhone X. This 6.5-inch ‘Super Retina’ display has a 2,688 x 1,242-pixel resolution (458ppi) and 1 million to 1 contrast ratio, and supports wide color for proper Dolby Vision and HDR10 content display. It also has True Tone, 3D Touch, and now, a faster 120Hz touch-sensing layer for smoother scrolling performance. Additionally, the phone has ’surgical-grade' stainless steel sides and a glass back that facilitates wireless charging, and is rated IP68 for water and dust resistance. On the other hand, the iPhone XS is, for the most part, a smaller version of the Max. It has the same screen tech as the Max, just that this is a smaller 5.8-inch, 2,436 x 1,125-pixel (458ppi, too) screen. 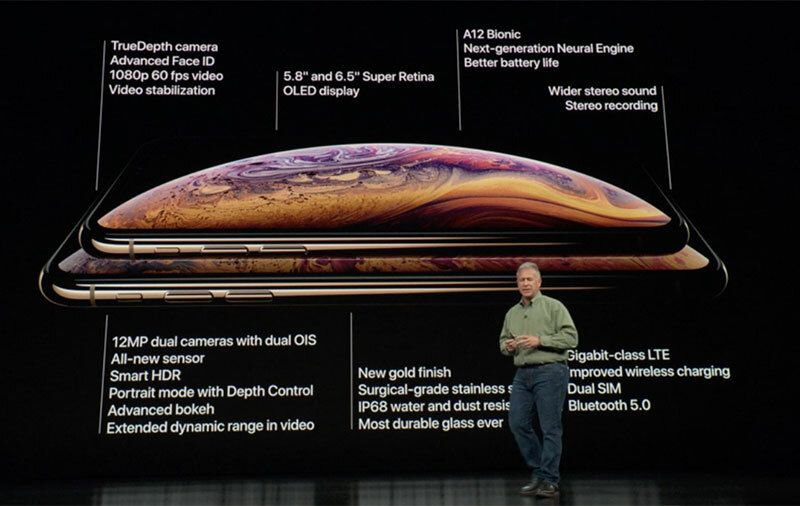 The two iPhone XS phones come with the new Apple-designed A12 Bionic chip, which is the first processor made on a 7nm process. The A12 Bionic packs a 6-core CPU (2 performance cores + 4 efficiency cores), a 4-core GPU, as well as a ‘next-generation’, 8-core (!) neural engine that handles all the machine learning and AI tasks. 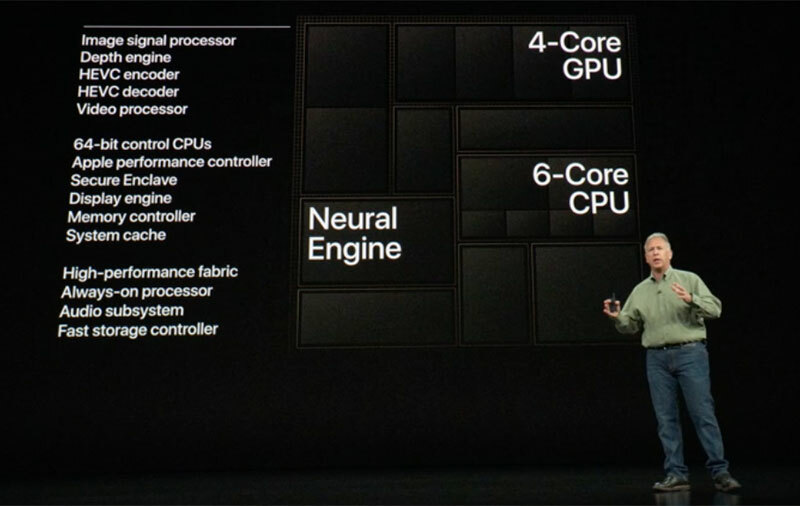 Calling it the ‘smartest and most powerful chip ever in a smartphone’, Apple says the A12 Bionic’s neural engine can process 5 trillion operations per second, a huge leap compared to A11 Bionic’s 600 billion. Apple also says the A12 Bionic enables apps to launch up to 30% faster. 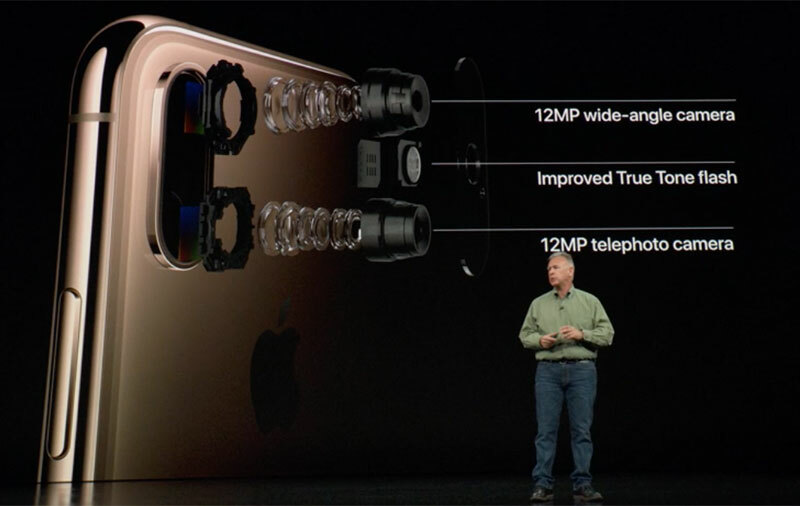 Both iPhone XS phones have a dual-lens rear camera with improved True Tone flash that now detects flickers better. The primary camera is a new 12-megapixel wide-angle camera with a 6-element lens and an F1.8 aperture. The secondary camera is also a 12MP module, but with a telephoto lens to enable 2x optical zoom. Both cameras support optical image stabilization. On the other side, the front-facing camera has a new 7MP sensor and an F2.2 lens. 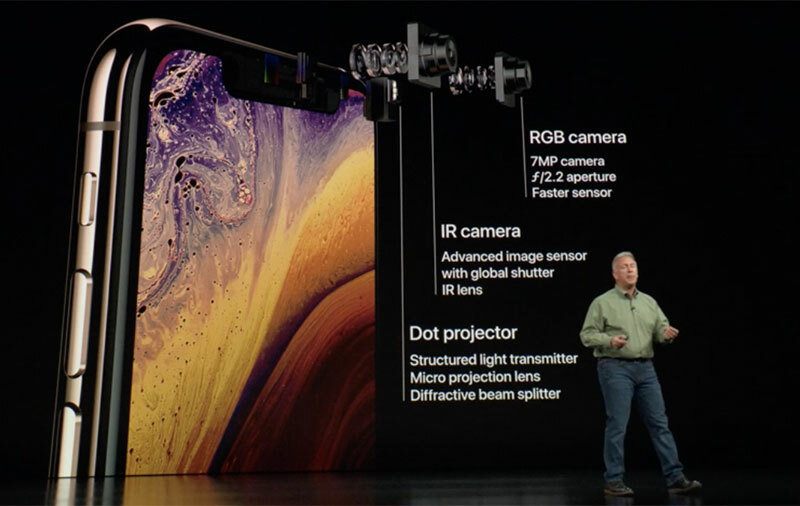 The True Depth system (dot projector, IR camera, flood illuminator) that makes Face ID possible is of course still present here. Face ID is supposedly faster too. Camera performance is an area that benefits greatly from the A12 Bionic chip. In addition to auto adjusting for exposure, white balance, focus, noise reduction, and highlight and shadow details, the new chip’s image signal processor and neural engine now also handle face detection, facial landmarking and segmentation. According to Apple, the iPhone XS can handle 1 trillion operations per photo. All this means better and more natural-looking photos, especially for portraits. In fact, the phones now let you do dynamic depth-of-field adjustments (simulating F1.4 to F16 effects) - even after a shot is taken. There’s also a Smart HDR mode that takes a constant 4-shot buffer and another 5 other frames (each capturing different data, such as one that’s overexposed for the extra shadow details) and then combine their best parts to get the best photo. In the videography department, the phones can now record stereo sound and the front camera can now capture 1080p/60 fps videos. The rear camera can capture 4K videos at 24 fps, 30 fps, or 60 fps. Regarding battery life, Apple says the iPhone XS lasts 30 minutes longer than the current iPhone X. The XS Max, which has the biggest battery ever in an iPhone, lasts 90 minutes longer than the X. Other features of the iPhone XS phones include gigabit-class LTE, improved wireless charging, dual-SIM and Bluetooth 5.0 support. They will ship with iOS 12, which is dropping first on Sep 17 for existing iPhones. Regarding dual-SIM, only units sold in China, Hong Kong, and Macau have two physical SIM slots. For other regions, the dual-SIM function uses a combination of a physical SIM card and eSIM. As such, it’s unclear at the moment if all our telcos here can support this feature. Pre-orders for the iPhone XS phones begin 3:01 PM on Sep 14, with a shipping date of Sep 21. Like the iPhone X, the iPhone XS and XS Max will be offered in silver and space gray finishes. But since this is an ‘S’ year, there’s also a new color finish: gold. The 5.8-inch iPhone XS has a starting price of S$1,649 for the 64GB model, and this goes up to S$1,889 if you want 256GB. If you want that 512GB model, you’re looking at S$2,199. The 6.5-inch iPhone XS Max is priced at S$1,799 for the 64GB model, S$2,039 for the 256GB model, and S$2,349 for the 512GB model. Wow. Read next: The iPhone XR has a 6.1-inch screen, an AI-assisted single-lens rear camera, and comes in 6 colors.